Passing Greenock Esplanade this evening, the products tanker CUMBRIAN FISHER was seen as she made her way upriver to Rothesay Dock to discharge her cargo of fuel from Amsterdam. 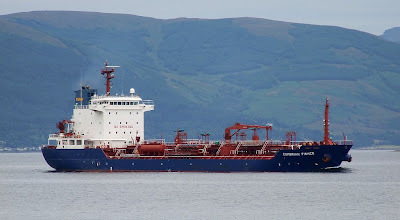 Owned by a company based in the Marshall Islands, she is chartered to, and operated by, James Fisher Everard Ltd. CUMBRIAN FISHER was built by the Samho Shipbuilding Co in South Korea, and was handed over in December 2004. The 127.2 metre long ship has a deadweight of 12,923 tonnes. She has a Canadian master, and British and Polish officers, with a Filipino crew, and is a sister ship of CLYDE FISHER, a vessel that has featured here a number of times.